Indeed, the growing trend of smart cities has a positive impact on this market owing to the fact that the capabilities and prominence of most smart cities revolve around the public transport networks. These systems will assist in the implementation of data and technology to improve railway mobility, sustainability and efficiency. For example, the Ministry of Indian Railways has allied with the Ministry of Urban Development to ensure smart stations’ development under the ongoing Smart Cities mission in the nation. Under this initiative, about 400 stations in the nation are currently being redeveloped with an aim of providing easier access as well as improved facilities for passengers. Such initiatives taken by government to develop the infrastructure of a country will further boost railway management systems market. Having analyzed the efforts undertaken by prominent industry players, it is evident that the railway management systems market will record a significant growth rate over the ensuing years. The competitive spectrum of railway management systems market is also quite diverse, comprising notable companies like Amadeus, Thales, Sierra Wireless, Atos, Alstom, Siemens, Hitachi, Trimble, Toshiba, Indra, Bombardier, Huawei, Nokia, IBM, Frequentis, EKE Electronics and Ansaldo, that have been striving to bring forth new, innovative products to the mainstream. 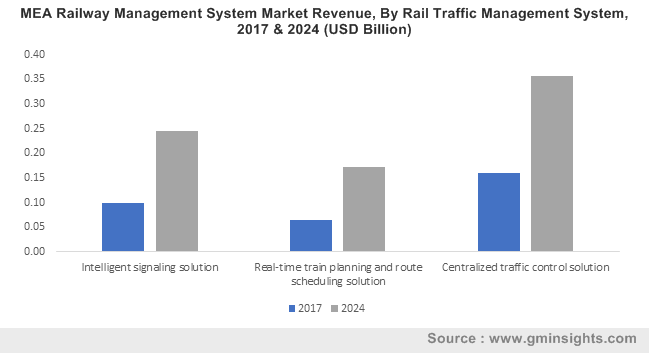 As per estimates, railway management systems market size is expected to surpass a valuation of US$64 billion by the end of 2024.